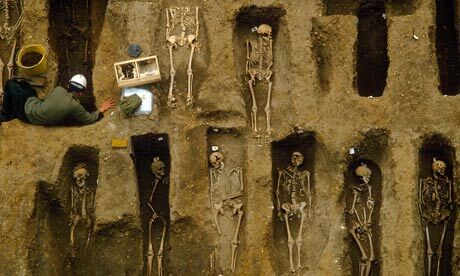 Diagnosing the Black Death: Will the Real Plague Please Stand Up? Law and order broke down. Many skeletons showed signs of malnutrition, brought on by the famines that had already been sweeping Europe in a time of overpopulation. This could only encourage the death rate. Fox News, however, gives us Black Death Wasn’t Actually Bubonic Plague, Study Finds. It portrays their article as a “fascinating siderbar” to the London excavation, but has almost nothing to do with it. It’s also likely to mislead. Doctors wore special protective gear when attending plague victims. The mask held sweet smelling herbs thought to hold the disease at bay. Two terms that float around people’s understanding of historical Europe include plague and Black Death. 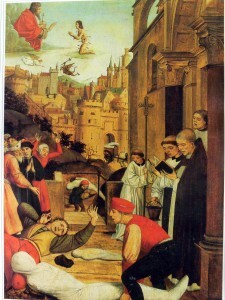 The Black Death was the first outbreak of plague in western Europe, stretching from 1347 to 1350. Almost the entire continent saw the disease, and about 1/3 of the population, or 25 million people, died. No other single outbreak was nearly as deadly, but it continued to strike for another four centuries, claiming tens of millions of people. 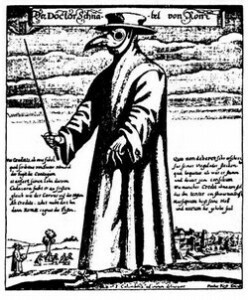 As an aside: People often think of the plague as medieval. However, most of the outbreaks were actually during the Renaissance. The term plague generally refers to a disease caused by the Yersinia pestis bacteria. (Sometimes you see it used in a more general sense such as the biblical ten plagues of Egypt, which had nothing to do with Yersinia pestis, but let’s set those aside for this discussion.) Frequently you hear the more specific term bubonic plague, which actually confuses the issue. Plague and bubonic plague are not synonymous, although lots of people think so. Thus, to say the Black Death was not bubonic plague makes a whole lot of people think we’re talking about an entirely different pathogen. 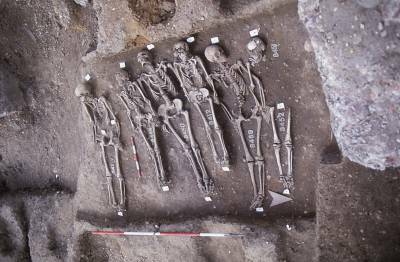 But the Fox article even states that the DNA of Yersinia pestis was indeed present in some of the London skeletons. So what does that headline mean? Yersinia pestis manifests in three forms: bubonic, pneumonic and septicemic. Bubonic is the most common and is caused by flea bites. The fleas commonly live on rats, although they can also be found on a variety of other rodents: there are prairie dog populations in the southwest United States where plague is endemic. Without treatment, bubonic plague kills about half its victims. It is the most common of the three forms and is generally credited as the primary cause of death during the Black Death. Pneumonic plague is airborne and almost always fatal, but it is also less common than bubonic plague. If the bacteria gets into the bloodstream, it becomes septicemic, which commonly kills in less than 24 hours and is 100% fatal. Survivors of plague outbreaks reported seeing friends fine in the morning and dead by evening. Luckily, septicemic plague is rare. Was the Black Death Caused by Bubonic Plague? The Fox article suggests the Black Death was primarily pneumonic rather than bubonic. It cites the incredibly quick spread of the disease in the 14th century in comparison to what we know of typical patterns of spread via rats and fleas. This certainly isn’t the first time it’s been suggested. Attributing the Black Death to the faster spreading pneumonic plague helps address the issue. But then the article gets weird. It compares the London outbreak to a recent outbreak of bubonic plague in Madagascar, saying the historical one in London was much more deadly, killing 60% of the population…which is right in line with the usual mortality rate of untreated bubonic plague today, so I don’t understand the comparison. It also unhelpfully remains silent on the actual death rate in Madagascar, which really makes the comparison no comparison at all. This article was amended on 3 April 2014 to make it clear that the pneumonic theory of the Black Death’s spread is Dr Tim Brooks’s own, as shown in the Channel 4 documentary. He is not associated with the Crossrail research. That is to say, this is a theory being floated by Brooks as others have done before. I’m not saying he isn’t right. I am saying this is the conclusion of some people but not nearly everyone who studies the Black Death. Moreover, Brooks’s background is in infectious diseases. He’s not a historian, and he has no connection to the dig the article is attempting to piggyback on. And he has a documentary to pimp. Citizens die even as the dead come in faster than bodies can be shrouded and buried. In the sky, St. Sebastian asks God to grant mercy upon the people. Sebastian is often appealed to in reference to disease not because his life was associated with it but because he was martyred by arrows, and arrows were common symbol of the spread of disease. The plague originated in India and China, where it continues to be found. It struck the Byzantine Empire in the 6th century, killing almost half of the population of Constantinople. It’s known as the Plague of Justinian (who was emperor during the first outbreak). It continued to strike until the 8th century, then vanished from Europe. The disease shows up throughout Europe in the 14th century, transmitted via increased trade between Europe and Asia. That outbreak is the Black Death. There has long been a vocal minority who have insisted that Yersinia pestis could not have caused the plague. Objections include speed of transmission, description of symptoms, and whether the carrier rats could thrive in winter climates, when many outbreaks occurred. 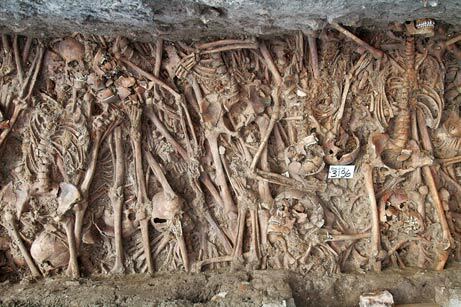 However, studies in the last 20 years have detected multiple strains of the DNA of Yersinia pestis in multiple plague graves. The death of a third of Europe created enormous social changes. Peasants and urban workers could demand better terms of employment due to labor shortages, while nobles scrambled to keep hold of their traditional authority and wealth, which was largely invested in landholdings worked by peasants. This helped bring down manorialism, the prevailing medieval economic and social arrangement, and encourage more modern systems. Women found themselves more able to compete with men. The city guilds, for example, were forced to accept women since product needed continued production. Many male guild members were dead, but their wives and children were often versed in his trade. Quality of life improved for many: Europe was overpopulated before the Black Death, and the massive die-off left an abundance of resources available for survivors. It also redrew maps. Some villages were so decimated that the few survivors simply left and never returned. The villages vanished.